Romantic Jungle Treehouses, Authentic Eco Luxury! Overlooking the deep blue Pacific waters off Costa Rica’s Osa Peninsula, the Copa de Arbol Beach & Rainforest Resort offers serene luxury accommodations and comfort. This beachfront property is an ideal option for couples, families, and retreat groups who want a secluded rainforest and beach experience with the comfort of air conditioning. Whether you’re on a family trip to Costa Rica or your honeymoon, you’re guaranteed to have a wonderful stay in any of the ten newly constructed cabins, all featuring stunning design and magnificent views of the surroundings. Guests will be picked up at Palma Sur or Drake Bay airstrip and taken to the lodge by boat. The hotel staff will take your luggage while you hop out of the boat on to the breathtaking beach. The hotel’s cabins are set along 70 acres of rainforest reserve between Drake Bay and Corcovado National Park. The sweet-smelling Balinese-style bungalows are gorgeous. It is the only hotel in the area with A/C, and rooms are also equipped with ceiling fans, a safe, and lavish tiled showers. The cabins don’t have TVs. Although being in the jungle makes for somewhat spotty reception, complimentary WiFi is available throughout the property and in rooms. The hotel’s enviable location is perhaps the biggest draw. Visitors are just minutes from the beach, which features strong tides but stunning views of the crashing waves. You’ll love exploring the area nearby, looking above you for monkeys and scarlet macaws, and below you for rock pools and their resident fish. End the day by contemplating the massive starry sky, free of city lights, and then be lulled to sleep by the sound of ocean waves. Freshly baked breads, specialty coffee, local produce, meats, and seafood make for exquisite dining at Copa de Arbol. Guests will be delighted with their full meal plan of breakfast, lunch, and dinner at the beachfront restaurant. They also offer a fully-stocked bar for afternoon cocktails. Staff is very accommodating of dietary restrictions, with prior notice being essential due to their isolated location. Take time to enjoy additional amenities like the cascading infinity pool, Jacuzzi, in-room massage treatments, stand-up paddleboards and kayaks, and, of course, the hiking trails! The surrounding jungle is pristine with cool creeks, towering trees, monkeys chattering above, and much more! 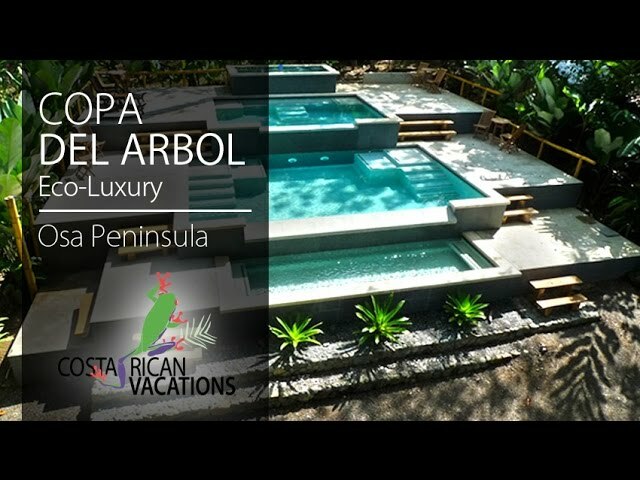 Copa de Arbol is an off-the-beaten-path property that will undoubtedly appeal to nature lovers and those seeking for understated luxury in an exotic locale. Basic rate includes full meal plan and non-alcoholic beverages, as well as free use of kayaks and paddleboards. Three-night (or more) packages also include round-trip water/land transportation to Palma Sur or Drake Bay airstrip, a tour of Corcovado National Park, and snorkeling at Caño Island. Since the property is only reachable by boat, getting to Copa de Arbol is an exciting adventure in itself. The cabins feature spacious sitting areas, stunning bathrooms, and sitting areas with magnificent ocean views. Unlike other boutique hotels in the region, Copa de Arbol is the only one that features air conditioning. Monkeys and other animals are frequent visitors, as are scarlet macaws. The restaurant features delicious dishes, all made with local fruits and vegetables (you have to try their wonderful banana bread!). The lack of televisions in the cabinas gives you the opportunity to truly unplug and unwind in nature. Each room is different, so be sure to talk with your Travel Consultant about what you are looking for. Note: Minimum 3 night stay. *Pricing based on double occupancy, four-night stay. Inquire now for more details!